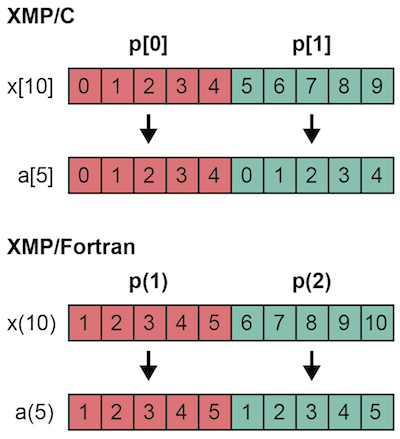 Procedure calls in XMP are the same as the base language. Procedure calls between different languages and external library are also possible if the base language supports them. In the below example, sub1() calls sub2() with a distributed array as an argument. If you want to use distributed arrays in arguments as distributed arrays in the called procedure, you need to redefine the shape of the distributed array in the procedure. But, if you want to use the distributed array in the argument as a duplicate array in the called procedure, you do not need to redefine them.